Slimmer, slicker and a little bit quicker, this Xbox One redesign hits all the right notes. The Xbox One S is an enormous improvement over the original Xbox One, and even a couple of minutes with this new design leave me wondering just how that original console ever was passed as acceptable through the many layers of Microsoft bureaucracy. The original was of course absolutely massive, something that it’s been suggested was a result of wanting to avoid any potential heat issues after the red ring of death debacle. Kinect was a huge focus at the Mattrick-led Xbox division and so there were ports and power for that bundled in. The system’s dashboard seemed to outstrip its capabilities too, generally well-designed but plagued with the bloat of a machine that wants to do everything. The marketing slogan summed it up: It was an all-in-one, but because of that it was a jack of all trades and a master of none. The Xbox One S (curiously not the Xbox One Slim officially) seems to exist primarily to draw a line under that era. It would’ve been easy for the Phil Spencer led Xbox to wait until Scorpio to draw a line under the mess that was the Xbox One’s early life but they’ve instead done so now. 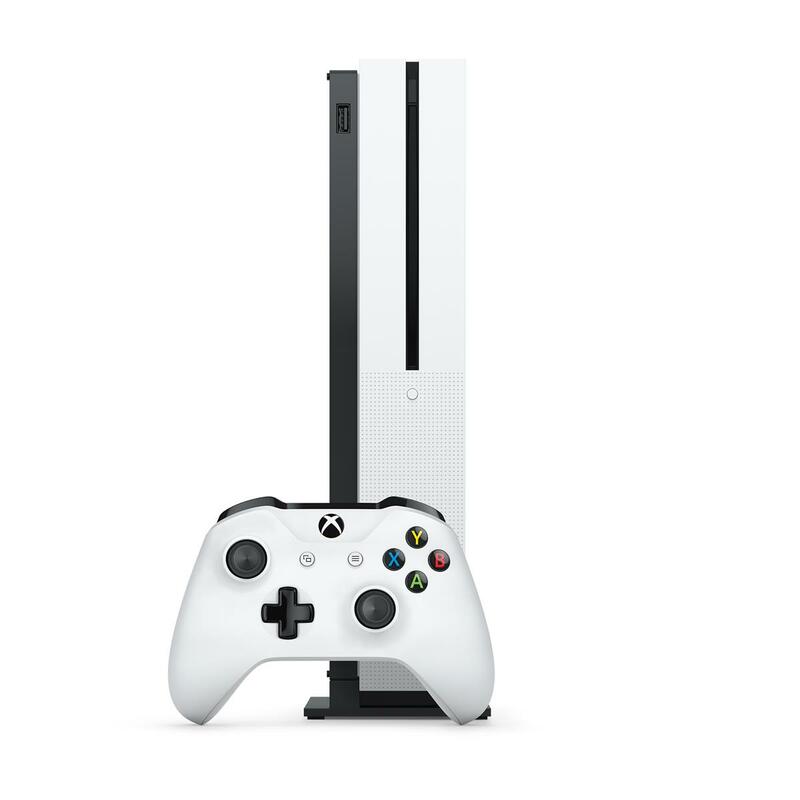 The Xbox One S works at that: it’s a sleek new redesign that finally feels like a worthy successor to the Xbox 360. Xbox One S – What’s New? The machine has a new design and form factor, but we’ll talk about that a little later. In terms of real features the machine actually comes packing a couple of all-new additions that end up feeling more noteworthy than you’d expect. The most significant addition is 4K output for TVs that support it. 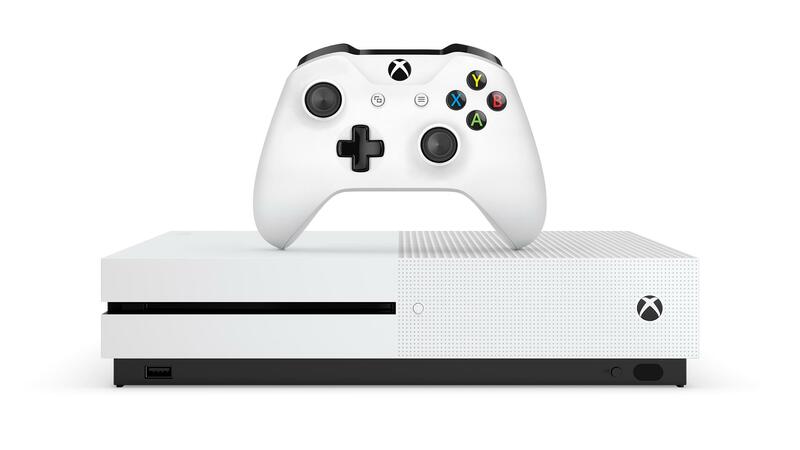 This output is limited to media and games will still top out at 1080p, but this still makes the Xbox One S a bit of a bargain: A 4K blu-ray player will typically run you a fair chunk more than even the lowest end model of the Xbox One S, which is the 500GB model for $299/€299/£249. It’s worth noting that the machine doesn’t support 4K blu-rays out of the box just as it doesn’t support blu-rays, requiring you to download the player app from the store. That’s a 60-second inconvenience, but then you’re ready to go. Also supported is 4K streaming from the likes of Netflix and Amazon’s Instant Video service, so those with the blistering connection speed required can also enjoy that. The 4K media output is a lovely addition and brings back to game consoles one of the things that made the PS2 and PS3 so attractive: including the latest movie and TV media while keeping the price similar ot cheaper to going out and buying one of those players alone. Speaking of TV, there’s also the smart addition of the IR blaster. The TV input remains despite a reduced focus on that sort of feature set in general, and because the Xbox One S doesn’t ship with a Kinect and requires an adapter to even use one Microsoft have slapped an IR reciever and blaster on the console. The IR is used for two key things: firstly it’s used for up to the Xbox One media remote, a handy little optional accessory that makes watching films and Netflix free of a cumbersome controller. Secondly it allows the Xbox One to send signals to your TV, cable box and sound setup. All this was previously handled by the Kinect and thus impossible if you didn’t have one hooked up, but it’s now standard on Xbox One S. It’s a solid addition and worth it for how the console turns the TV on or off when you boot it or shut it down alone. Xbox One S HDR Gaming – What does it mean? HDR is high dynamic range images, and it’s a term that has been floating around in photography for a while now but is relatively new to video entertainment like movies, TV and video games. The long story short is that HDR images allow for a greater amount of contrast between the lightest and darkest points. Darker blacks and lighter whites makes for an overall higher quality image with a greater level of detail. This is the sort of detail that theoretically should become particularly welcome when there’s high-end particle or lighting effects in games. I’ve found HDR images just tend to pop more in movies, and the brief gaming HDR demos I’ve had at E3 for Gears of War 4 and Forza Horizon 3 both impressed. With that said as it currently stands there aren’t any games currently on the market that actually support this option available: games have to be specifically built with this feature in mind. HDR-enabled games are coming in the near future however. Only the Xbox One S will be able to display them with that feature. Given how different HDR is on a technological level as with 4K it requires an actually HDR-enabled TV to work, so keep that in mind – if you don’t have the right TV, you’ll be looking at an upgrade. Arguably the biggest point of the Xbox One S is to revise the Xbox One’s blocky design. It does pretty well in that, and I’m actually of the opinion that it’s the slickest-looking console since the magnificent slim PS2. Microsoft are claiming it’s 40% smaller, though they’re a bit cheeky in how they’ve calculated this: It appears that it’s 40% smaller including the original Xbox One’s power supply, given that the S now has an internal power supply like the PS4, eliminating the power brick entirely. Having an internal power brick is a great change, and the S is significantly smaller than its parent. It isn’t quite as small as the 40% claim might have you imagine, though. 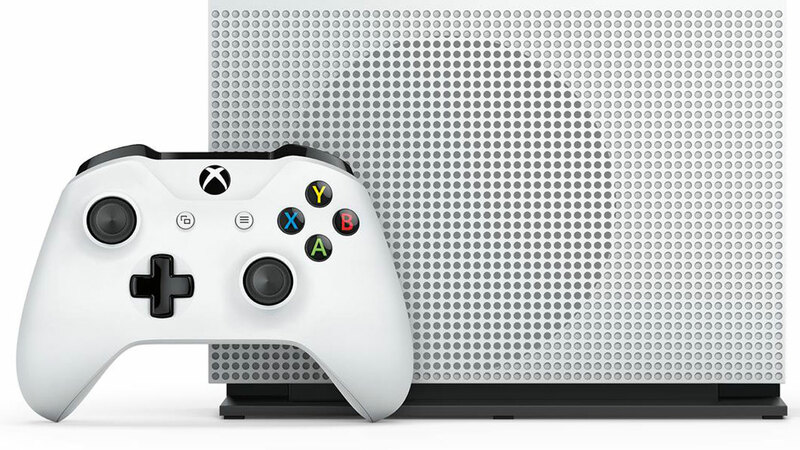 In size terms, the Xbox One S is at least comparable to the launch PS4 and the Xbox 360. Regardless of the specifics of the measurements it feels a hell of a lot smaller and sleeker, and has the added bonus of now being able to be stood upright with a stand that’s included with the 2TB model and will be sold separately when later models launch. Keep in mind the console isn’t like the original fat PS2 – it can’t comfortably stand upright without the official stand – it’ll be a tad wobbly in that position. I still feel the console looks much better sitting flat anyway, but the option is welcome. The redesign gets rid of the irritating side-mounted USB port of the original console and also replaces the weird flat buttons, which I’ve always hated, with far more tangible ones. I’ve never been the greatest fan of tech in the Apple-like white, but this console looks bloody great. It might look better in black – hopefully they do it down the line. I’m a huge fan of how the Xbox One S looks, and if your console sits in plain sight that might be another plus towards this upgrade. Much as with the console itself Spencer’s team plainly wasn’t happy with the original Xbox One controller and they’ve made a number of changes over the last few years to adjust it. 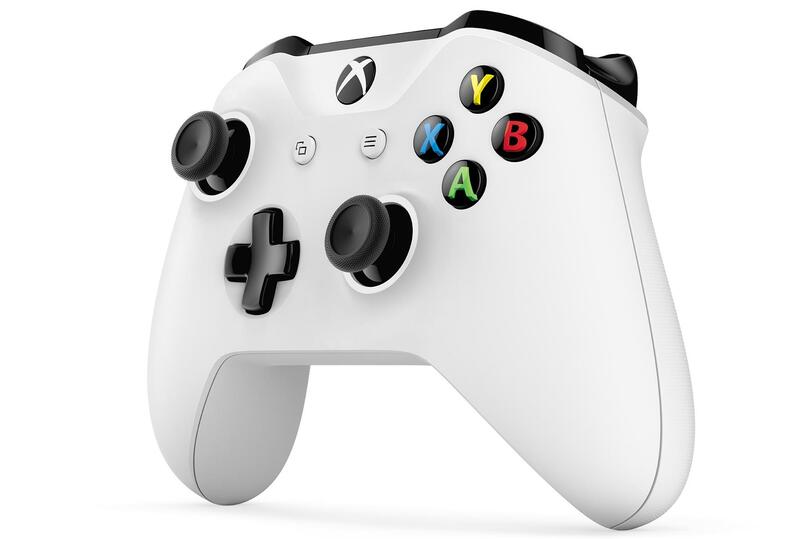 The Xbox One S ships with the culimnation of that, a new controller that has the same basic form factor but has been subtly adjusted to improve it. I consider it a significant improvement; it feels more rounded and more comfortable and the bumpers/shoulder buttons appear to stand out more like those on the Xbox 360 controller. The pad also now includes a bluetooth setting, meaning it can sync to PCs or even tablets and the like for easy use there, a very welcome addition. Best of all is how the bottom of the controller features a subtle rubberized texture on its underside. This feels noticeable and stand-out at first but like any good change blends into the background and becomes an unnoticeable bonus to comfort as time goes on. The controller changes are simple, but they absolutely nail it. Xbox One S – Does it play games better? As mentioned earlier, the Xbox One S will enable HDR experiences for games made with that in mind. Beyond that it also is a slight clip more powerful than the original model, though how games utilize that varies depending on the title in question. We’re no Digital Foundry, and so it’s better that we simply defer to their expertise somewhat here and link to their wonderful in-depth look at Xbox One S game performance. The headline is this, though: games with unlocked frame rates are likely to see a bit of a boost. Some games DF tested saw FPS boosts of up to 9fps in certain circumstances. Other games that targeted 30fps but saw drops below that on the original Xbox One simply remained more consistently at 30fps on the S, while other games such as Fallout 4 showed no particular performance increase. This comes down to the guts of the Xbox One S: some parts of it perform identically to the Xbox One or near enough to it. How each game is making use of the system’s power will determine what sort of boost, if any, it’ll get from it. Linked to this is the sluggish dashboard. I find the Xbox One S to be a little quicker through those menus than my regular Xbox One, but it still feels to be too slow all things considered. The dashboard still needs work, and the extra RAM bandwidth appears to have not helped too much. The Xbox One S 2TB launch edition is available now for $399/€399/£349. You can learn more about Microsoft’s run-up to launch on our Xbox One S hub page. 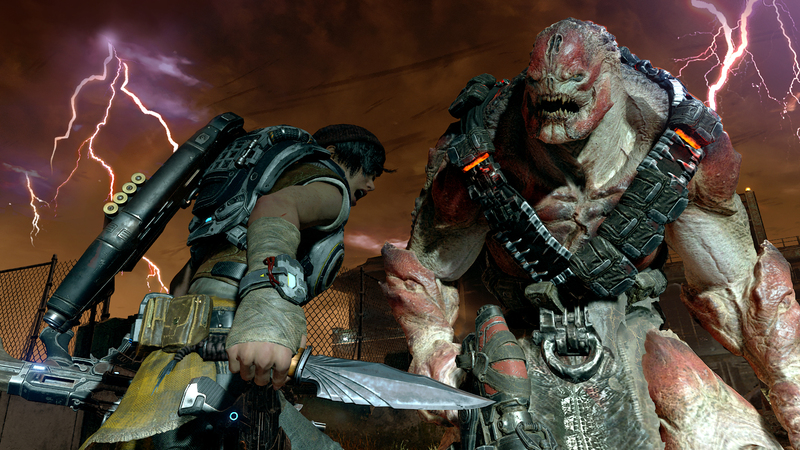 Gears of War Limited Editions, 1TB and 500GB models are all also coming soon. Let’s pose a question: How happy are you with your Xbox One? Everything hinges on this. The Xbox One S feels a significant upgrade to the original but it also doesn’t do enough actually different to encourage all Xbox One owners to take the plunge. Where the Slim 360 was a safe haven at last from the red ring of death design, this provides minor upgrades that add up to a decent of quality of life improvement but equally stops short of finding a killer app that makes it a must have. 4K TV adoption is still low, but Microsoft is likely thinking of the future with that part of this design. Even when Scorpio launches next year they’ll likely keep a cheaper Xbox on the market – this will become that. This is a lovely redesign, but it’s certainly not a must-have. Its changes are huge leaps in comfort and it’s undoubtedly an excellent tweak to everything the Xbox One was, taking on board feedback and addressing a number of major complaints. It’s a better console in pretty much every way, yet it’s still not possible to recommend it as a must-have. 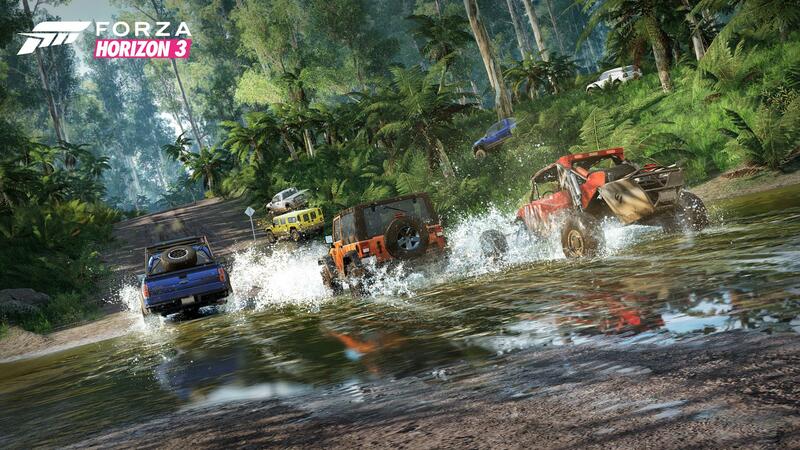 So, how happy are you with your Xbox One? And how much do you play it? If you’re not entirely satisfied and use your Xbox a lot or simply don’t own an Xbox One yet this is a great stepping stone towards the Scorpio. If you can sit tight for a year to see what Scorpio is, it might be worth doing so.